Google Launches New Social Post Options — CROWD. 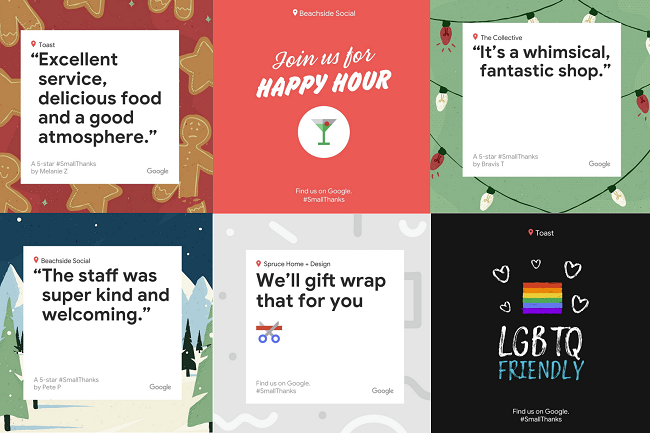 Just in time for the holidays, Google has launched a selection of “social post styles” in its marketing hub Small Thanks. The new templates let businesses exhibit reviews and product benefits in bright, fun styles. Google sees advertising customer reviews as the big draw of the new options, saying “You can turn your customers into advocates by showcasing your business’s real Google reviews with new seasonal posts from Small Thanks.”. Different display options can be used to underline your brands unique benefits and services. The initiative offers a simple but effective way to add some festiveness to your promotions this season and well into next year. An Introductory Guide to "Nanoinfluencers"